Key design elements considered in the development of the VEO+ are user and performance focused. Based on a superior and innovative digital technology, four available PA configurations (16:64PR, 32:64PR, 16:128PR or 32:128PR) are offered as software options. Along with Xpair Cloud Remote Access and Export to CSV, the FMC-TFM gives access to FMC recording of the acoustic information, and TFM imaging phased array probe. 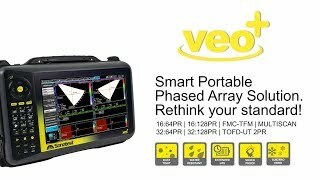 The Veo+ offers superior data throughput and unsurpassed computational capacity. It delivers fast and accurate results using an impressive 32 channel PA beamformer that provides exceptional SNR, through the use of enhanced digital signal processing. Data file size is not a concern for the Veo+ thanks to its 64-bit Linux operating system because it can count on a fast 128GB SSD memory capacity allowing you to record huge amounts of information in a single acquisition file. The intuitive menu system is application and workflow driven, with set up and operation swiftly becoming second nature. Integrated help and Wizards guide the user through scan set up whilst Optimisation Tips ensure the Veo+ always performs at the highest level. Fast and efficient wizards for sound velocity; wedge delay, TCG, DAC, TOFD setup and Encoder calibration are all provided as standard. The inspection plan shows the operator in 3D where probes are positioned on the test part, simplifying the inspection set up and providing an inspection reference for reporting. Using the latest computer technology, data can be permanently recorded for processing and report generation. All adjustments to focal laws are instantaneous, with angle resolution to 0.1° and up to 1024 focal laws without loss of performance. Using Sonatest’s Xpair software application, Veo+ can be fully used and controlled remotely, via a simple network connection. Veo+ now offers WiFi along with its fast GB Ethernet port. 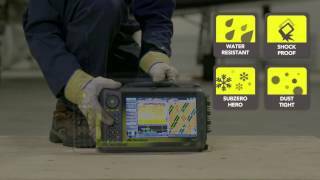 Xpair opens the doors of true mobility in the NDT market. It is a PC-based software application solution to manage data transfer and remote control of instruments in the field wherever a network connection is available. Moreover, with the Xpair Cloud option, a user can access and remotely pilot the instrument of a colleague located 1000s of km away using a mobile or wired internet connection. UTstudio+ makes inspection data management easy. Loaded with a comprehensive user interface, data analysis and setup file construction becomes natural and straight forward. From customised views to additional gates, measurement tools or refined colour palettes, UTstudio+ helps you generate extended reports and much more. 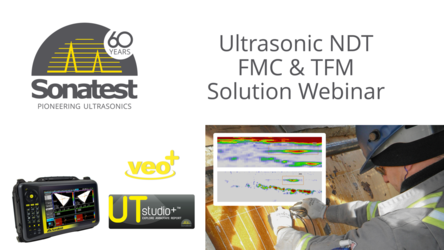 Suitable for FMC-TFM, phased array and conventional ultrasonic technologies, UTstudio+ is able to accomplish amazing things and get the job done for a multitude of simple advanced applications. One UTstudio+ licence FREE with you veo+ purchase. Loaded with comprehensive user interface, inspection data and results are now freely accessible to anyone who wants to review them. From customised views to additional gates, measurement tools or refined colour palettes, UTview helps sharing results with collaborators to get the job done faster. Efficient and effective scanning can also be achieved when the Veo+ is partnered with Sonatest’s wheelprobes, namely the new WP2.